One of the most popular sightseeing cities in the world would be Tokyo. There are lots of unique pubs and bars among traditional Japanese ones. Tourists can experience many different sides of Japanese culture. – Nakame Takkyu (Takkyu means table tennis) Lounge offers you a place to enjoy drinking alcohols and playing table tennis. After a long day of sightseeing, why don’t you visit this place to take a break? In this trendy town Nakameguro, there is an old building house Nakame Takkyu Lounge. There is no visible sign or mark to show about this lounge thus you may think this is a residential place. You need to buzz their buzzer to get inside. You may feel odd to go inside, since the place does not give great sporty friendly vive. But you would rather hear Jazzy easy BGM and see comfy sofa seating in dim lighting because they would want to offer quality time with your friends. This tranquil atmosphere would give you feeling as if you are at friend house having relaxing time. Due to this uniqueness, their customers are vary: local youngsters, business men and tourists. They are always in full swing, and lately become more popular amongst tourists. Nakame Takkyu Lounge offers you a place for table tennis, as well as a full menu for food and drinks. For alcohol lovers, their menu includes beers, Japanese sake and original cocktails. You can try prosciuttos and original cheese sausages with your drinks. They only have one table for tennis, so you need to shear it with others. 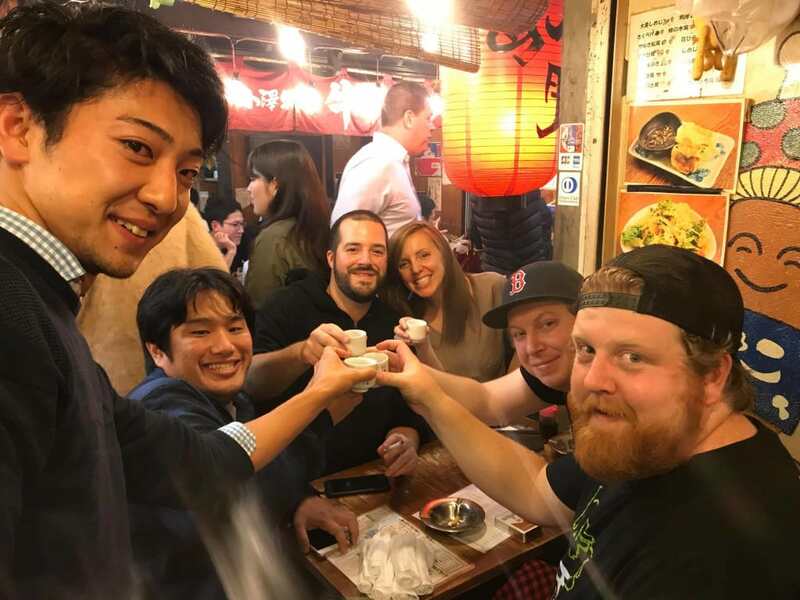 They are located near the Nakameguro station, the area has other bars and pubs to enjoy drinking so it’s a perfect place for Japanese binge drinking experience. This is the one of places to enjoy night out in Tokyo. You can hair the lounge for a private use outside of their business hours. This is the only place you can play table tennis when you are bit tipsy, why don’t you try to do so? There are many bars and pubs in Tokyo that offer high quality entertainment like the table tennis lounge. There is Penguin Bar where you can drink with real penguins. Horror storytelling Bar, Kaidan Live Bar offers you a professional storyteller’s live show. Alice café is a themed café based on the story Alice in Wonderland. They are all unique and one and only place in Tokyo. It’s a guaranty that you would make great memory. Shinjuku hosts many famous night-out places. It’s good place to do Tokyo Pub Crawl Tour. Many different groups people come and visit there, therefore, you would never feel, as you are an outsider.Why don’t you read the article and have a bit of idea about Japanese binge drinking.